Preheat oven to 220°C (425°F). Place the cauliflower, garam masala and 2 teaspoons of the oil in a large bowl and toss to coat. Place on a large oven tray and cook for 20 minutes or until tender and lightly charred. Add the cashews and cook for a further 3 minutes or until golden. While the cauliflower is roasting, make the curry paste. Place the cashews and boiling water in a small bowl and set aside for 5minutes to soak. Place the ginger, garlic, garam masala, turmeric, fennel, tomato paste and salt in a small food processor and process until finely chopped. Drain the cashews, add to the processor and process until smooth. Heat the remaining oil in a large heavy-based frying pan over medium heat. Add the curry paste and cook, stirring, for 3 minutes. Add the water and bring to a simmer. Add the chickpeas and beans and cook for 4–6 minutes or until tender. Roughly chop the roasted cashews. 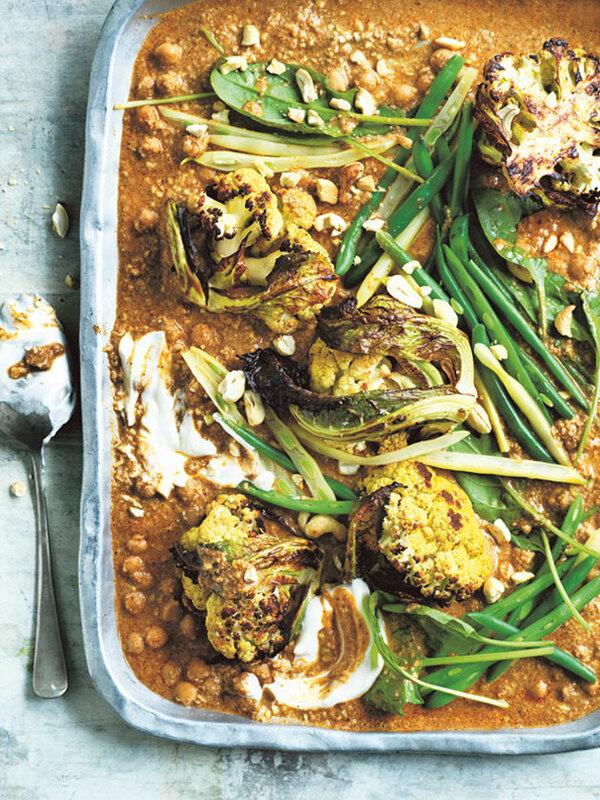 Add the cauliflower and cashews to the curry and serve with spinach leaves and yoghurt. Serves 4. Delicious! I added a whole chilli to the paste for some heat also a smalll tin (165mls) of coconut milk to the sauce. I had some chicken thighs to use so seared them in olive oil and garam masala and added them to the curry. Definitely a keeper.